Bishop Pompallier and his Marist brothers first arrived in Aotearoa 1838 (180 years ago) and and the First Marist school in Pitt Street opened in 1884. 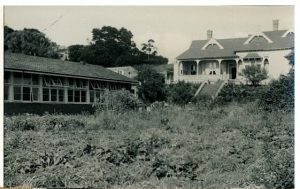 From there, Sacred Heart opened in Ponsonby in 1903 and they then shifted to Glen Innes in 1955 and renamed the Richmond road site as St Paul’s. To meet the need of the local Onehunga community Marcellin College opening in 1958. This site was formally the Scholastica for the training of young marist brothers as teachers, and they lived in the building that houses administration at the top of the site. The bunkroom they all shared is now the staffroom! The college opened with 2 classes of Standard 5 and 6 (year 7 and 8) boys and grew slowly from there. Early students talk of the playing fields being a peat swamp that was drained, and would periodically spontaneously combust – causing the whole school to have to go out with wet sacks to extinguish the fire! In 1982 St Benedicts in Newton, a girls school founded by St Mary MacKillop closed down and the girls came to Marcellin, creating the first co-ed catholic school in Auckland. The chapel was added in 1992, the 2 storey MacKillop block in the early 2000’s and a new gym in 2007. The last Marist brothers teaching at the College ( Brother Kevin King and Br Peter Thompson) retired at the end of 2016, and the school is still in good hands with dedicated catholic teachers who continue to uphold the vision St Marcellin Champagnat had for education. Chris Lewis (1957-), Tennis professional, Men’s finalist at the 1983 Wimbledon Championships.